Cats are well known wanderers, and in the summer months, they're even more likely to head off on their own adventures. In fact, we received almost 2,000 calls about missing cats to our National Information Line in the last year, with the highest numbers reported in the last two months. This summer, we're encouraging people to make a final check of their sheds and outbuildings before locking them. Whether you're storing away your garden furniture or stashing your bikes away, make sure you take that final look to ensure a stray cat isn't trapped inside. Download our handy door hanger to place on your shed door, reminding you to #Lookbeforeyoulock. Remind yourself to #Lookbeforeyoulock with our handy door hanger. 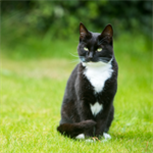 Keep your cat safe outside with our handy tips. Take a look at our guide on what to do next. Beloved cat Wispa lost 2kg after being locked into a garage for 20 days.